Size of this preview: 387 × 599 pixels. Other resolutions: 155 × 240 pixels | 310 × 480 pixels | 387 × 600 pixels | 496 × 768 pixels | 661 × 1,024 pixels | 2,457 × 3,805 pixels. 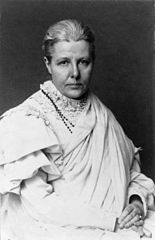 English: Annie Besant, half-length portrait, seated, facing slightly right, clad in the style of the Aesthetic Dress movement. This is a retouched picture, which means that it has been digitally altered from its original version. Modifications: complete restoration. This image has been assessed under the valued image criteria and is considered the most valued image on Commons within the scope: Annie Besant. You can see its nomination here.